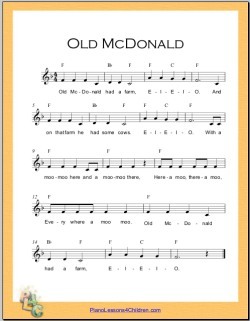 All kids love singing Old MacDonald Had a Farm! 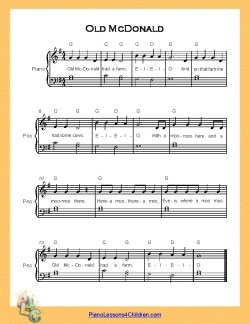 Sing along using this video. This video has the lyrics running along with it. This other YouTube video below changes the tune a little bit in the E-I-E-I-O part. 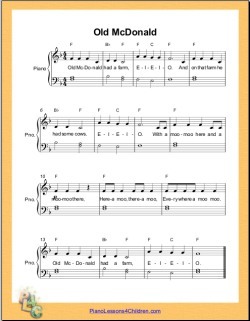 It also has a cow named Kissi-Moo and a sheep named Betty... a really fun, groovy version of Old MacDonald! 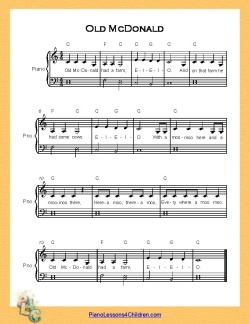 In each verse, you choose an animal and its sound. Old MacDonald had a farm, EE-I-EE-I-O. 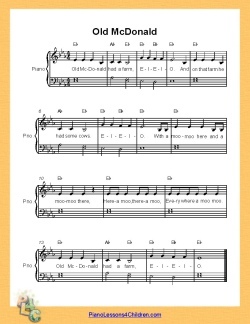 For example, using a cow as an animal, and MOO as the animal sound, we get: Old MacDonald had a farm, EE-I-EE-I-O. You can also omit the "with a" before the animal sound. Click the images below to open and print the "Old MacDonald" free sheet music. Right click and choose "Save link as" to download the PDF files to your computer. 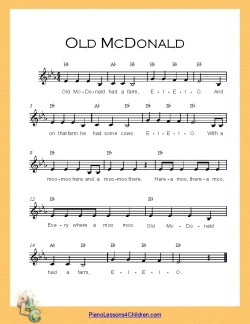 See my piano lessons for Old McDonald song!